‘Behind closed doors’ is the best description for much of Paris because it is the secrets… the surprising finds… that are the most entrancing. 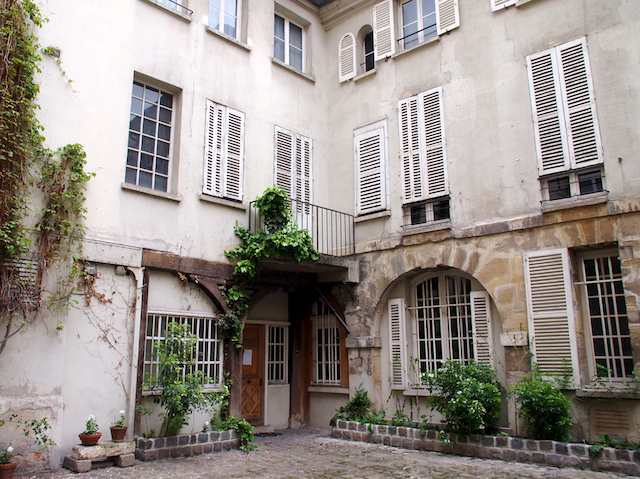 Last week as Jeanne and I walked with Australian author John Baxter through his Parisian neighbourhood I was delighted to find this hidden courtyard. We passed through the most non de-script gates… I would never have noticed them… to find such beauty and loveliness. It made me realise how much we miss… how much can escape us… even when we think we are being our most observant. A cobbled courtyard, wonky walls, paint that has seen better days…shutters askew and tumble down plants… I adored this shabby chic scene of Paris. I loved that this courtyard had aged, that it was nowhere near perfect… that some might even refer to it as ‘broken down’. It was hard to imagine that we were in the heart of Saint Germain des Prés… that we were in the centre of a busy metropolis… It was as if time had stood still. This is exactly the sort of delight that I love to find in Paris……17 sleeps and counting!!!!! One of my favorite things about Paris and all of France…the unexpected! Glad you found this charming corner. I think that's one of the best things about Paris – all the hidden treasures. You never know what you will find when you enter a set of gates. And the French have a way with shabby – they can make it look spectacular with such ease. Your Paris' posts are wonderful! I so enjoyed all of them! And today's is just awesome!The imperfection is so charming! Thank you for sharing with us all these treasures! it's so warm feeling and charming. I think only when one has the time can we expect to find these lovely vignettes of times past. Just wonderful, Vicki. It really does look as if time stood still, right there in that exact spot. Dear Vicki, Didn't I give you a copy of that remarkably lovely, little (perhaps 6"x6"), and extraordinarily useful book "Quiet Corners of Paris"? Any fan of Paris should buy this book (it's quite available on Amazon). It's written in English, with photographs by Christophe Lefebure illustrating each of the 90 or so "secret gardens" of Paris….cloisters, mostly-forgotten courtyards, passages, tiny arboretums, the gardens of obscure museums no one visists anymore. In short?… all the places which, if you know where to find them (and the book is very good at directions, addresses, etcetera), you can step in and find yourself wondering "Wait?…am I still in the middle of an enormous city?". All of these "quiet corners" are quite well-maintained….the fact is simply that no one thinks of (or recalls) them very much, and they're never mentioned in the guidebooks…and most of them are charming refuges for ten or so people, at most. My mother-in-law (French, as you'll know) loves this book. Two of the "quiet corners" are within a block of her own mother's former Paris apartment (now ours), so my mother-in-law has spent decades trotting past them without knowing they existed. Every garden needs this. When designing new gardens I always include portions of it. Historic gardens always have it. Improves things with intellect, passion, desire. Love the colours and the textures in these images. France has such a different beauty than what we have here in the Pacific Northwest. I think the light is much brighter. That said?…the fact remains that you have one, very small book from me, whereas I have two very large books BY you. Personally, I think I got the better deal. .. lovely post .. I have always been truly amazed at what we don't see beyond those gates .. I take pictures, when one is left ajar .. but I think if I just opened a few, what would happen? Probably nothing as they are usually various apartments behind, no? I think "cobbled courtyard" has to be one of the loveliest word combinations. Ever. Beautiful shots, I wish that I lived there! secret courtyards – I used to love spying them through gates – you might get a quick glimpse if someone was coming out/going in! Paris is always full of secret places! In Budapest there're so many potential courtyard, but unfortunately so far away from shabby chic…. It is true that Paris has so many hidden treasures for those who take the time to look. I am forever looking in entryways, courtyards, pushing in doors etc. SO much to discover. Enjoy! I love the hidden pockets of Paris. But I love finding spots that are so "not Paris" within the city even more! I just love this!!! it reminds me of home!! !The home of my childhood! Completely charming! I love the different textures on the walls and that little rounded top window near the top floor. The character of this courtyard is truly cozy, I would have been squealing with delight if I was with you. The photographs are wonderful. There is a reason so many flock to this area of the world and you have caputured it so beautifully in a photograph. 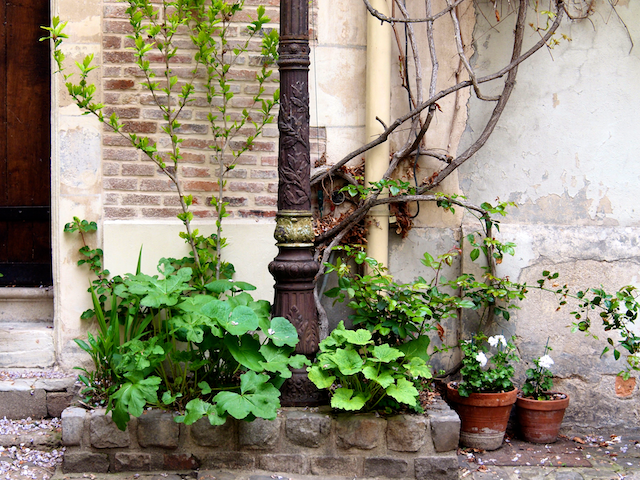 If you had been in Paris in January, you and I might have crossed paths photographing this lovely courtyard! I must have taken 50 photographs all around it. Down the cobbled street at Procope, one of my blog readers from Texas recognized me and said she had seen us 4 times that day. What fun it was to meet her and take photos. Isn’t blogging remarkable?? And yes, please count me in on the giveaway. I’m eyeing the linens as I occasionally photograph babies and thought I needed to find a pretty piece of linen to nestle them in! Love the “new look” and as always your photos and stories you share. Vicki, This year Mother’s Day will be much different for me as I lost my mom in December. She truly was my best friend. Even though I am mother, I have never felt the joy of receiving for that honor as much as I did giving to her. You have a great 2nd Mother’s and again love your messages new and old. We have just moved into Le Marais, a little loft apartment which is all light, colour & eclectic goodness. How could we know we would find our home, full of love, through the tired & tarnished door that faces the street…? That’s what makes this city so special! Thanks for the beautiful blog! Love this courtyard. Your photographs are great, Julia C.